High tech products manufacturer Irisys has been congratulated by Lord Green, Minister of Trade and Investment, on its strong growth in exports for its infrared sensors, detectors and thermal cameras. Lord Green's visit to the company's global headquarters, is part of a tour to meet the bosses of some of the UK’s leading business success stories. Irisys has doubled its turnover in recent years with exports accounting for more than 80% of the company’s turnover and at the same time increasing its diverse staff by 30%. “This was a great opportunity to meet an innovative business that is researching, designing and manufacturing here in theUK. They are leading the way in exporting and I hope this visit helps to emphasise to others how important exporting is to developing their business and securing their futures in markets around the world." Irisys has a diverse range of skills on its staff, where one in six employees have PhDs and where jobs are being created in IT and software design, manufacturing, service and sales. 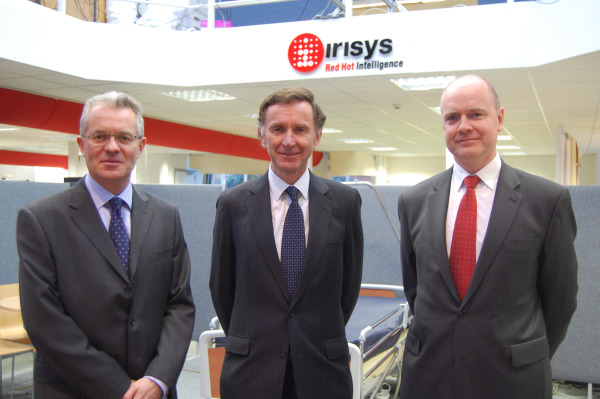 Irisys recently appointed its 100th employee. Irisys which pioneered new markets with its technologies for retailers sells its products in over 50 countries worldwide and has seen strong growth in mainland European and North American markets, where one of the largest supermarket chains in theUSis installing an Irisys queue management solution. In February 2011, Irisys announced a groundbreaking automatic monitoring and alerting system for the NHS that aims to tackle hospital ‘superbugs’ and save £1bn annually.